Shelter cabins in the Alaska Wilderness were once a lifeline for arctic travelers. …in a million-acre frozen wilderness, under an infinite sky that pulses with light and color. 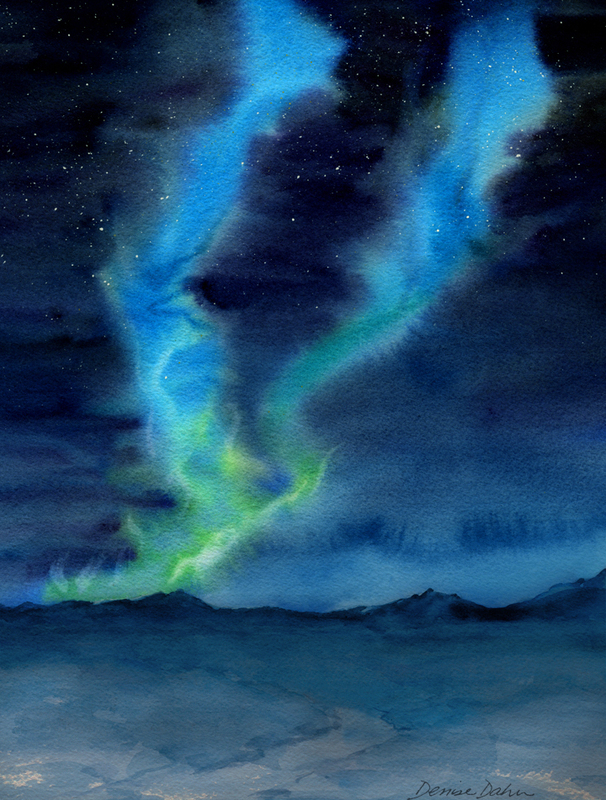 I did this watercolor of the Aurora on the tundra from imagination. It’s winter in the year 1913. You’ve left Fort Yukon and are headed toward the Brooks Range, the northernmost divide between the Arctic Ocean and the rest of Alaska Territory. For weeks, your only companions have been your sled dogs and the sharp-tempered, unforgiving arctic cold. Wrapped in furs, you’re warm enough to function, but comfort is just a long-faded memory. You grip the handlebars tighter as the sled whooshes along, knowing you can’t let your attention wander for a second—at least until you’ve reached the shelter cabin. Once you’re safely set up inside with a fire and food and tucked into your bedroll, then you can relax. Then, you’ll have a moment or two before sleep when your thoughts will fly free. Then, you can let the arctic work its magic on your soul. For now, you need to stay focused. You need to remember where you are—teetering on a thin line between life and death on top of the world. Don’t let the shivering green spirits in the sky distract you. Pay attention to the serious, heavy cold. Alaskan wilderness trails were once sparsely dotted with tiny cabins that sheltered trappers, missionaries, mail-carriers, freighters or other travelers. They were not owned, but were shared by all. 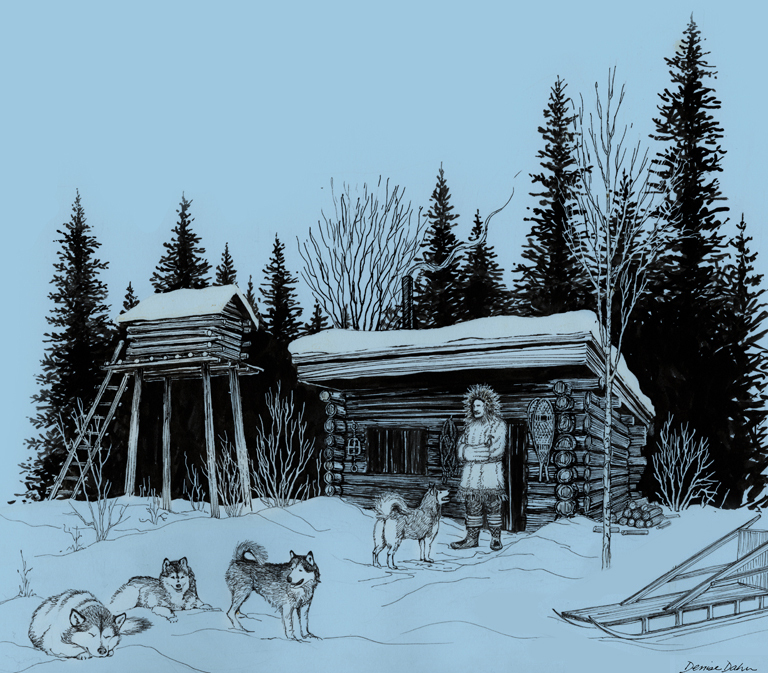 It was a culture of survival, necessary in the harsh Alaskan winter. Each person who stayed there left something behind for the next person: firewood, matches and perhaps a tin of food or a shot of whiskey. I did the cabin illustration for an interpretive sign on the Steese Highway, for the Bureau of Land Management, at the location of a historic shelter cabin. This is the first in a series of posts in honor of the 50th Anniversary of the Wilderness Preservation Act. The next post will be the story of two people who found love and adventure in Arctic Alaska, ultimately leading them to a life of activism and wilderness preservation. Without their persistence, we might not have Wilderness Areas today. As always, I love to hear from you! Have you ever been in Alaska? On a dogsled? Winter-camping? What do you think of our Wilderness Preservation system? Leave a comment, subscribe to the blog, and join me on Facebook!